These are the 12 principles discussed in the book ‘21st Century Garden cities of To-Morrow’ by Philip Ross and Yves Cabannes. A Garden City is a fair, just and harmonious community. It is not restricted to new cities or towns or those built following traditional Garden City town planning, architectural or design principles. A Garden City is about community, not merely about architecture and urban design. The Garden City owns itself. The Garden City is energy efficient and carbon neutral. Provides access to land for living and working to all. Fair Trade principles are practised. All citizens are equal, all citizens are different. There is fair representation and direct democracy. Garden Cities are produced through participatory planning and design methods. Knowledge is held in common, shared and enhanced. Wealth and harmony measured by happiness. A Garden City has a harmonious relationship with nature and is energy efficient. A Garden City is a carbon neutral city and does not pollute; its planning, design and resources are deployed to achieve this goal. Citizens and the government in the Garden City have a collective responsibility in their daily lives to design and implement such policies. This could be ensuring the provision of clean, safe and efficient public transport, the ability to navigate the Garden City by walking or cycling on one hand and the ability to reduce waste, recycle and reuse resources by citizens on the other. The Garden City promotes urban agriculture, the ability for citizens to grow most of their own food, even in an urban area. There is a right of free and fair access to the land for all residents to grow their own food whether it is through common allotments, common land, farms, productive streets and parks or private gardens. Alongside this is the right to affordable housing and also the right of access to resources in urban areas to build or run their individual or collective businesses or workshops. It is a productive city that aims at its own self-sufficiency providing opportunities for agricultural work, crafts, commerce and industry. Rents are provided to encourage self-sufficiency and regeneration, provided in partnership with tenants, not just for tenants. The goal is for the City to be productive and sustainable in its own right, not as a dormitory settlement or a place of mere consumption. The Garden City is committed to the practises and ethics of Fair Trade implementing the credo that its prosperity is not built upon the suffering of others, whether inside its own city limits, inside its own country or internationally. The prosperity of the Garden City is shared in practise among all its citizens, not just among the rich, wealthy and establishment. Participatory budgeting through which citizens decide on the priorities for public and community investment is one of the key mechanisms in practise. To secure the wealth and trigger jobs among the community, it can create local or a complementary community currency and set up community banks. All citizens in a Garden City are equal regardless of how long they have lived there or how many generations of their family has lived there. There are no special privileges for anyone. A Garden City provides support, treats with dignity those with mental and physical disabilities and values each citizen, irrespective of their religious or sexual orientation. There is a right to participate in the Garden City, in what the city does, how it is run and who does what. A Garden City can be made up of many cities and towns but each of these will be comprised of different neighbourhoods and communities, each with differing needs and aspirations. The prosperity of the Garden City is employed to help those in greatest need. Each community and neighbourhood should be empowered and encouraged to form its own free and open association, council or forum to represent and engage the views and needs of that local community. The Garden City will share its decision making. It will devolve some to representatives but also by engage directly and meaningfully with the citizens so all can have an informed say and collective decision making power on the priorities for the Garden City. A Garden City is in harmony with the landscape, water, air, nature and the surrounding countryside. New developments and housing have Garden City space and design characteristics and aim to promote the health and wellbeing of its citizens, current and future and are developed through participatory methods on fundamental issues, not just cosmetic ones. Public spaces are widely available as an important concept as they provide the means for people to meet and share views and to integrate. These public spaces and facilities bring together young and old, rich and poor, those of different races, religions and backgrounds as a community that celebrates and rejoices in its diversity and exercises tolerance and freedom. These are the characteristics of a Garden City. Not all can be present but the guiding principles of a new Garden City will be to: Share, Enjoy and Prosper. 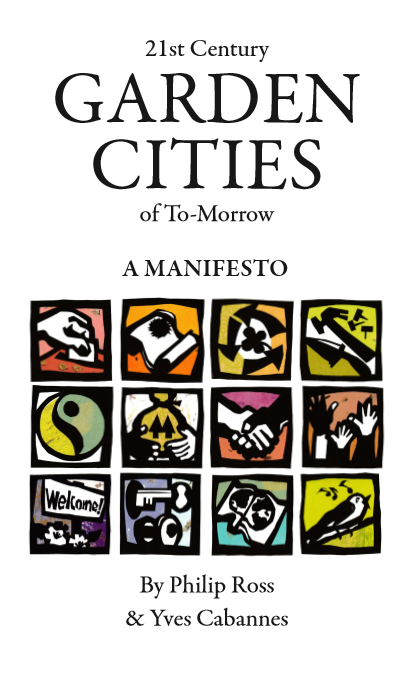 What turns the sharing of the Garden City’s prosperity from an act of paternalism or charity to one of empowerment and citizenship? It is people not just having a share in the City’s prosperity but a share – an active say – in how it is spent and what and where it is spent on. It means people having a chance to participate and speak for themselves and make informed decisions. I was brought up in WGC – by design, taught Design & technology + a gardening club. M.a. @ Uel. on the appropriate intervention of the artist in the architectural planning process. . .(the introduction a lot about garden cities.) Worked in community gardening & environmental improvement projects with community groups. Now doing permaculture Diploma (2yrs minimum) & currently living in Lancaster. Looking forward to communicating more & possibly meeting you guys. . .